Bargain back issues up for grabs! Want to catch up on some great digital magazines? Well for the next, TechRadar's parent company, Future Publishing, is having a sale! 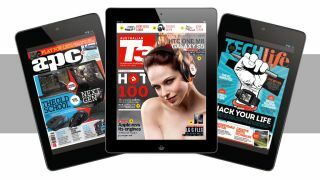 Available on both Apple Newstand and Google Play now, you can grab digital back issues of TechLife (iPad/Android); T3 Australia (iPad/Android); and Australia's longest running computer magazine, APC (iPad/Android). So whether you're filling gaps in your collection or simply want to get a hold of a great in depth how-to, be quick - the sale ends August 4.